I decided pretty early on in my research about homeschooling that a chronological study of history was sensible and appealing. After all, history has a clear path to it — it begins at creation and moves steadily toward the present day. Why not study it that way? 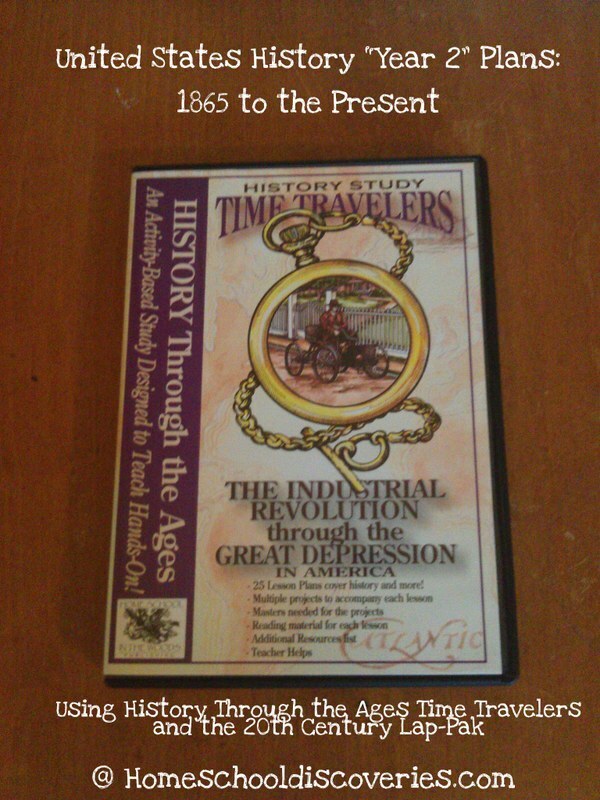 Like most of us, I didn’t study history chronologically when I was in school. In fact, other than a brief study of state history in sixth grade, I don’t remember studying history very much at all in school until I had US History from the Civil War to the present in 8th grade. After 8th grade we moved to a different school district, and I took a year of Ancient History in 10th grade, and another year of US History from the Civil War to the present in 11th grade. Lucky me to get the same thing twice! I guess if we wouldn’t have moved, I might have gotten the first part of American History sometime after having gotten the second part. Despite my lack of history study at school, I grew up in a family that loved and appreciated history, and we watched many historical movies and documentaries at home. My mom passed on to me her love for European history (especially the history of England), so in college I selected the History of Western Medieval Europe and The History of England as humanities electives. While I did enjoy all this exposure to history, it was very disjointed. I knew a lot about a few time periods, while knowing next to nothing about other important time periods (like the Revolutionary War or other early American history). With Miss M, after dabbling in a bit of light US History and World Geography in her Kindergarten year, we embarked on what I planned to be a 4 year history cycle when she was in 1st grade. We covered world history from creation to about 1600 using Mystery of History, then switched to US History, which I plan to cover over two years. Then we’ll go back to Ancient History. Me: Mrs. B___ told me that this book [a book about the underground railroad] was her daughter M___’s favorite about that topic. Miss M: Oh, is the B____ family studying American History this year too? Me: No, they study history a little bit differently than we do. 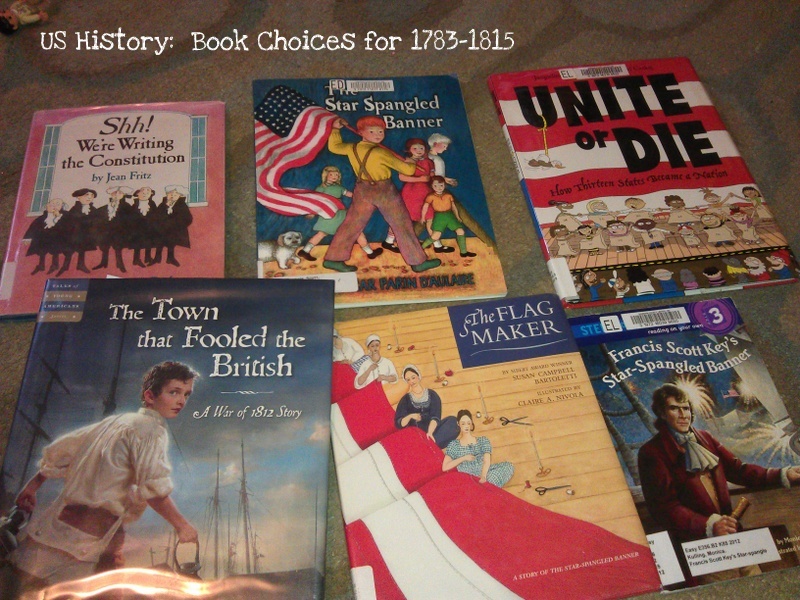 They study different picture books, and use those to inspire their studies of different topics in history and geography. I prefer a chronological study of history, so that’s what I planned for our family. 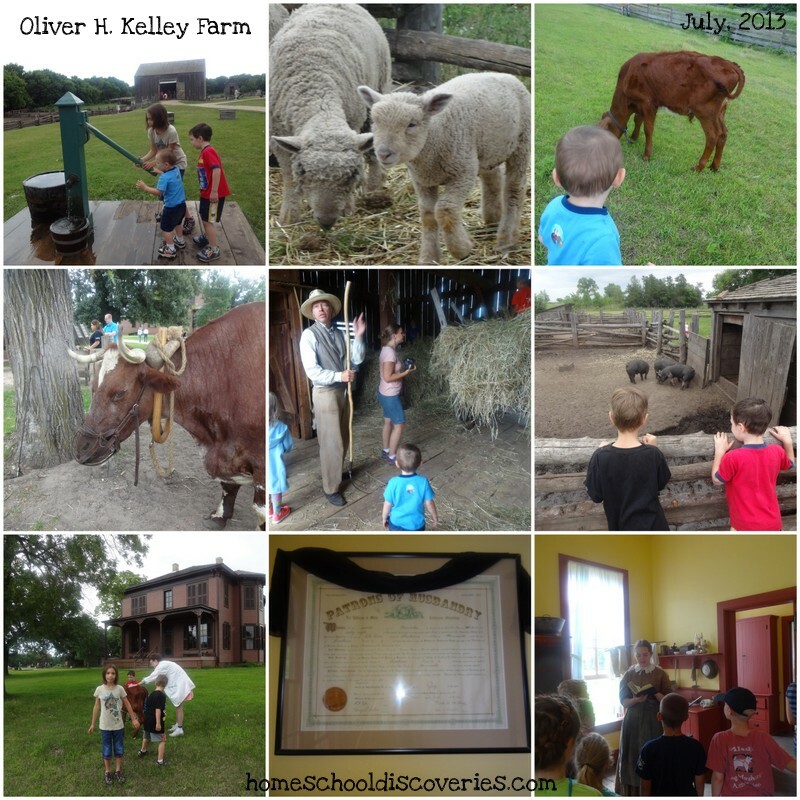 Miss M: Oh, so what does chronological mean again? Miss M: That makes sense. Like we started this year at the beginning of American history, and we are moving closer and closer to now. Me: Right, but we started a couple years ago, way back at the beginning of time. Do you remember that? Miss M: Oh, you mean those books we used to read? Miss M: Yeah, those seemed kind of like a bunch of random stories. You mean they were chronological too? Me: (wanting to smack my forehead). Yes, they were definitely chronological. I guess we should have kept up on our timeline. Maybe then it would have been a bit more obvious that it was chronological! Do I regret using Mystery of History (volume 1 through the first half of volume 3) in first and second grade? No, but I now can look back on it and see that we could have done “something else” and her overall memory and understanding of history from Creation to 1600 might not be all that different. She definitely enjoyed it most of the time while we were reading MOH those two years, and she always looked forward to our history time together. Will I continue with a chronological study of history? Yes, if nothing else because it does make sense and seem easier to me as far as planning goes. We may even repeat Mystery of History again, since Miss M will get a lot more out of it as a 5th-6th grader (and Mr. E will be a 2nd-3rd grader when we wrap back around to ancient history!). But maybe we’ll also take more time for tangents or “out of timeline” topical studies. After all, there is so much history to learn that a person can easily spend a lifetime learning about it! When I made my spreadsheet of books for our US History studies this year, I originally stuck A Pioneer Sampler by Barbara Greenwood in the “activities and crafts” category. So when it arrived from the library a bit after we started our most recent history unit (focusing on the pioneers from 1815-1860), I just put it in the book basket and didn’t look at it very closely. As our unit progressed I finally took the time to look at it. I discovered that A Pioneer Sampler does have some crafts and activities in it, but it has quite a bit of other content besides that. A Pioneer Sampler follows the life of a fictional pioneer family (The Robertsons) on a backwoods farm in 1840. Each of the nineteen chapters in this fairly lengthy book (240 pages) tells a short story – a vignette if you will — about the life of the Robertson family over the course of the year. Following each story are one or more short informational sections discussing everything from weaving fabric to making fires to getting lost in the woods. Intermixed with these factual sections are directions for trying some of these activities at home — like growing a potato plant, making butter or painting with stencils. In some ways this book made a great read aloud for a unit on the pioneers. Short chapters broken down into sections make it easy to read a portion each day. Since we started this book late in our unit, we felt a bit rushed to try and finish it all. By the time we were about three-fourths of the way through the book, Miss M and I mutually decided not to finish it as a read-aloud. We had already moved on to our next history topic, and we have too many other interesting books beckoning to us from the book basket. We’ll hang on to it for a bit in case Miss M wants to read a little bit more on her own. As interesting and thorough as this book is about pioneer life, I did feel it was a bit redundant for us. Between the many book basket fiction and non-fiction selections we had for our pioneers unit and our previous reading about pioneer families (including the Little House on the Prairie Series, the Little House on Rocky Ridge series, Caddie Woodlawn, and Bound for Oregon, a book we recently read) I think I had already picked up many of the tidbits of information this book was presenting. I would probably recommend A Pioneer Sampler for readers less familiar with 19th century pioneer life who don’t plan on reading an extensive list of books on this topic. You could read this book and call the general topic of pioneer living pretty well covered. An independent reader who is highly interested in pioneer times might also find this an interesting read. I’m sure it’s within Miss M’s ability to read on her own if she finds herself interested and motivated to do so. 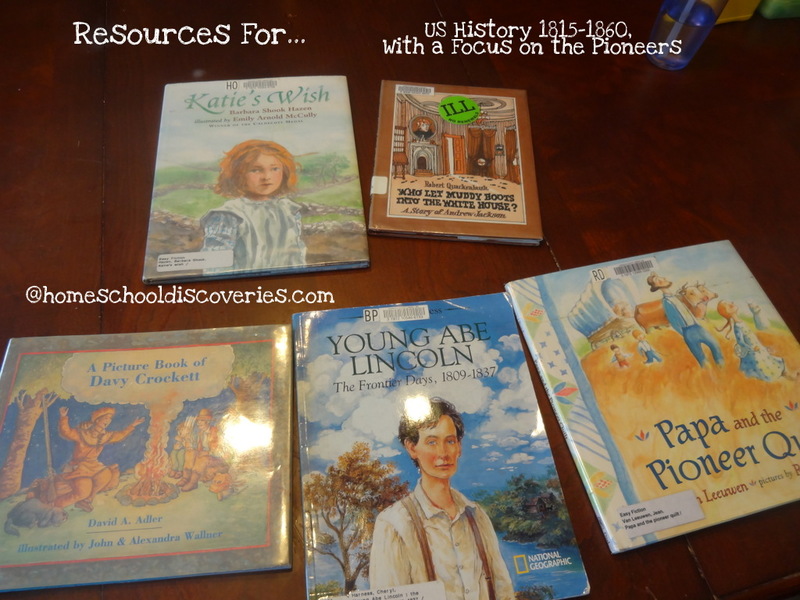 We’ve pretty much finished up the 5th unit/topic in our US History studies for this year, looking at the years 1815-1860 with a focus on the pioneers. Unlike previous units, I’m trying to get this written up before it gets too foggy in my mind. 😉 We still have one or two books to finish up that fit more into this topic, but since there is overlap timeline-wise between this unit and our next unit (focusing on slavery and the underground railroad during approximately the same time period), I feel like this unit is “done enough” to wrap up. I had a hard time finding just the right “spine” or key text for this unit. I really wish that the Maestros had continued their American Story series beyond the “New Nation” book, which ends with the War of 1812. Those books give such a good overview of the time periods they cover, without giving too much detail. Other books I considered were too detailed or lengthy for the ages of my kids. I was hoping for something that would give a bit of a socio-political overview of the time period between the War of 1812 and the Civil War. Westward migration and slavery are certainly two key topics, but other things were going on as well. We tried out a few chapters of a vintage book, “This Country of Ours” by H. E. Marshall. It was okay, but the kids weren’t “into” it enough for me to feel it was worth our time to continue. I decided that since this is just 3rd grade/Kindergarten US History, I would just forgo finding that big picture “overview” and trust that our assortment of book basket books would be enough. After all, up until recently I don’t think I really knew exactly what else was going on between 1815-1860 (other than the pioneers, the gold rush and the slavery issues) anyway! One book I did discover toward the end of this unit was “A Pioneer Sampler.” I had requested it from the library but didn’t look at it very closely until it had been in the basket for a while. I had been under the impression it was mostly an activity book, but that’s not really the case. Look for a post about it coming soon (maybe later this week). Of the three Louise Erdrich books, only Birchbark House originally appeared on my read aloud list for this unit. But we loved it so much that we went ahead to the next two books in the series. 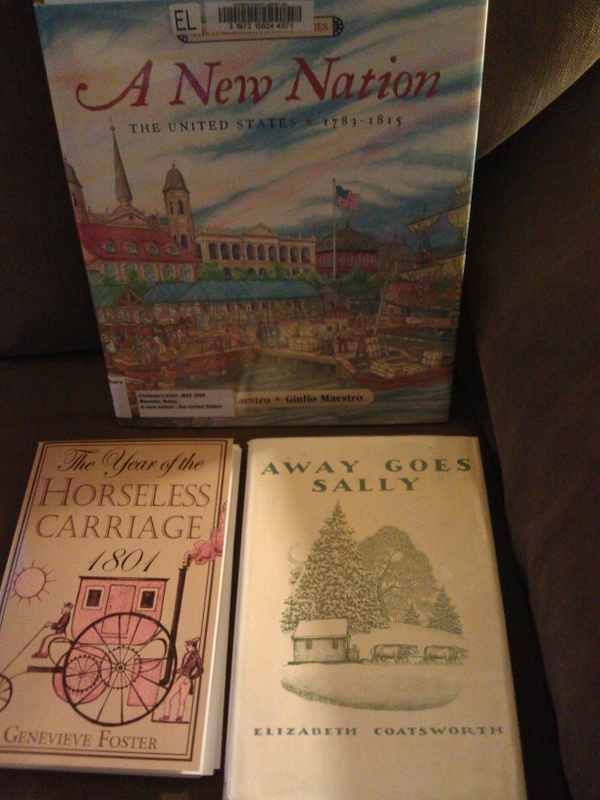 Doing this meant we dropped a couple of more traditionally pioneer-oriented read alouds I had scheduled. I am really okay with that, however, since I feel like our reading of the entire Little House on the Prairie series a year or two ago (even though it falls in a bit later time period) gave us a good background on the pioneer life in general. Carolina’s Courage by Elizabeth Yates — A story about a young girl traveling west in a covered wagon and a challenging sacrifice she is asked to make in giving up a cherished possession along the way. Three sets of the “American Girl” books are set during this time period — Kirsten, Josefina, and Mary Grace/Cecile. Miss M has read the Kirsten books several times in the past (they’re her favorite of the American Girl books) and she did not re-read them at this time. She did read all the Josefina books for the first time and re-read 5 of the 6 Mary Grace and Cecile books. She also read the “Welcome to Kirsten’s World” and “Welcome to Josefina’s World” non-fiction companion books that go along with those series. I filled our book basket with over two dozen books for this time period. You can see a list of most them in my US History Year 1 spreadsheet. Miss M read many of them independently, with the boys only asking me to read a couple of them out loud. The boys love the “You wouldn’t want to be…” series, and “You Wouldn’t Want to Be an American Pioneer” was no exception. I read aloud to all the kids “Young Abe Lincoln: The Frontier Days” (We read this story about Lincoln’s early years on Abe’s birthday, no less! ), “Who Let Muddy Boots into the White House?” (a humorous book about Andrew Jackson), and parts of “Day that Changed America: The Alamo” (a very, long and detailed picture book that I tried to squeeze into far too few minutes before a trip to the library on the day the book was due and couldn’t be renewed! ).